Fixed lobe or sleeve bearings have the annoying property of becoming unstable at relatively high speeds and/or light loads. The problem is that sleeve bearings (i.e. 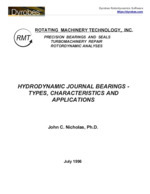 all journal bearings excluding tilting pad bearings) support a vertically downward load or force with a displacement that is not directly downward but at some angle with rotation from bottom dead center.